ie. 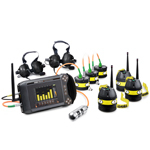 rubble, snow, mud etc..
LEADER Search is the next generation of the already established Audio ResQ wireless system. It uses many of the unique key features but is also lighter in weight, more compact and has a new interface with user friendly menu and graphics. It offers greater ergonomics for improved use, increasing speed and efficiency. LEADER Search detects the presence of buried victims under rubble and identifies their exact location using Wireless and/or Wired ultra-sensitive seismic sensors. Furthermore, LEADER Search allows two-way communication with the victim once they are found thanks to its communication probe waterproof up to 2 meters. Thanks to its lightweight and compact control box and thanks to its new clearly interface, LEADER Search allow a detection and a victims location more faster. NEW control box lightweight (1.225 kg) and compact (L 24.4 x H 15.5 x P4.9 cm) designed speciﬁcally for search application!